I’m pretty sure that making a long sleeved merino dress is the last thing on my Winter Wardrobe list, and its not even officially winter yet! It certainly feels like winter, its snowing down south and it was 4 degrees this morning when I left for work. Talk about frosty! Happily, I now have a whole range of snuggly home made merino clothes to keep me warm. I’m sure everyone has seen this pattern by now, its the latest one from Colette. 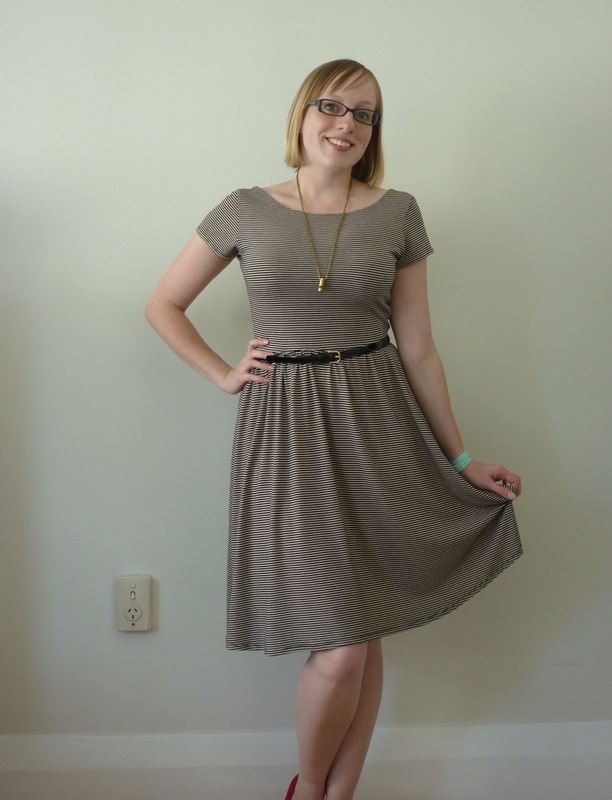 I’ve had some pretty major fitting issues with every Colette pattern that I’ve tried, which is such a bummer because I love their style! I figured that since this is a pattern for knits, fitting shouldn’t be such an issue, and its such a cute style that I decided to give it a crack. Unfortunately, I still had trouble getting it to fit. I took about an inch out of the under arm area, tapering to the end of the sleeve and waist, which made the bodice fit better initially. 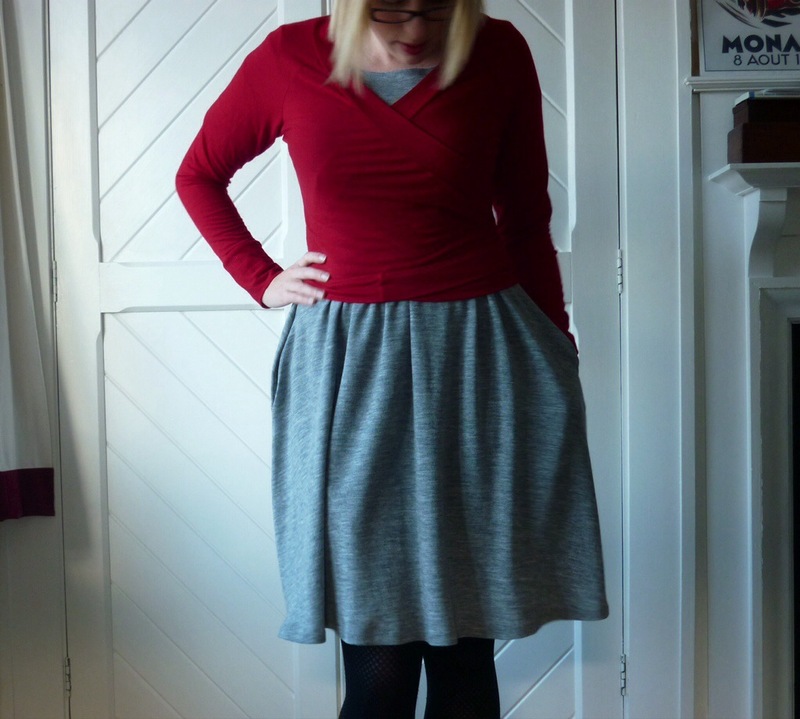 It was a really good length, hitting at my natural waist almost perfectly, until I added the skirt. 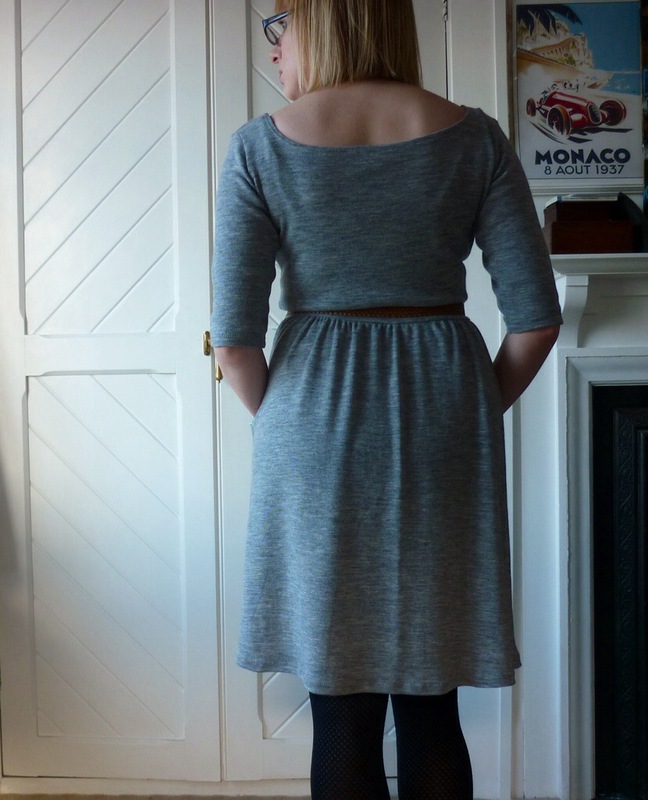 Then the extra weight dragged the whole waist down to a really unflattering point! I took the skirt off, removed the elastic, and re-shirred it with a shorter length of elastic, which does a much better job at keeping the waist where it should be. I think my main problem was my fabric choice. I went for this lovely thick merino knit because it was really soft and warm, not thinking about the fact that it is super stretchy, much more so than the fine jersey merino I have used so far. It just keeps growing! When I put it on on Sunday morning, the fit was quite snug in the torso, but by the afternoon when I took the photos for this post it had already begun to sag, especially in the back (as seen in the above photo). It has stretched out in the armpits as well, not very flattering! 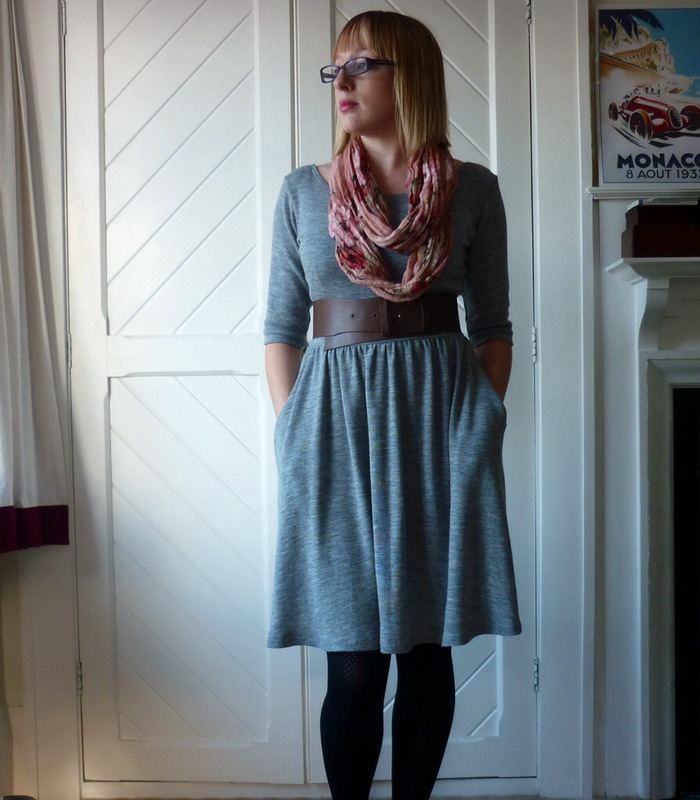 Possibly grey was not the best colour to pick either, Monsieur said it was a bit boring and matronly (horror!). Should have gone for navy! I was trying to pick a neutral colour that i could pair my masses of navy and mustard and red winter accessories with…oh well! 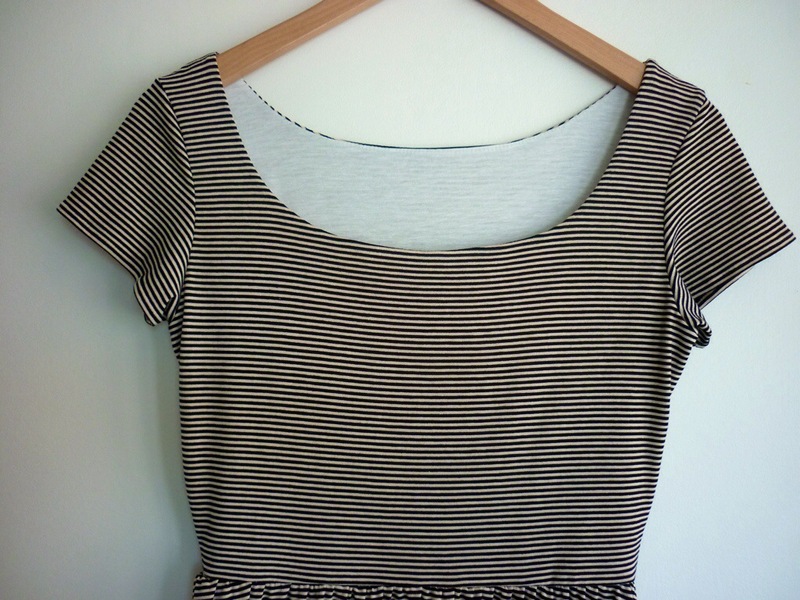 I definitely plan to make another one of these for summer, because its a really nice shape, and I love the neckline and all of the collar variations. Hopefully all of the problems I had with this one will disappear when its made up in a cotton knit!